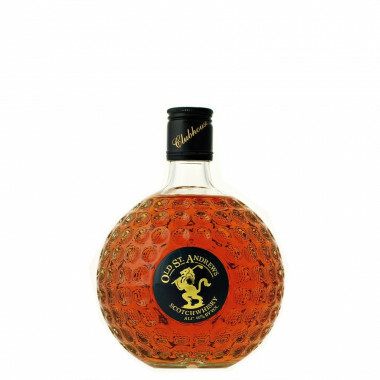 With its sweet nose and malt, brioche and caramel notes, this golf ball-shaped whisky bottle is the flagship of the Old Saint Andrews company, expert in bottlings related to golf. Special care has been taken when crafting Clubhouse, from bottling to labeling and packaging, as everything is handmade in the warehouses of Old Saint Andrews. The bottles and miniatures offer a luxury blend named Old Saint Andrews, referring to the famous Scottish golf course. The main Single Malt that enters in the blend mainly come from Speyside. The Old Saint Andrews company presents here the perfect gift for whisky and golf lovers. A nod signed Old Saint Andrews: "There are millions of golfers worldwide and you probably know one of them. Maybe a friend, a member of your family or a colleague. Golf is not just a hobby for them, it's much more than that. They do not "play" golf, they are golfers!" Not only is this whisky contained in a beautiful bottle, but it has also received the excellent note of 90/100 in Jim Murray's Whisky Bible, who described it as a whisky of great quality. Nose: charming and subtle. Notes of white fruits, pears, citrus fruits, lemon, quickly overflown by aromas of cedar and pepper, with an increased fruitiness. Palate: pleasantly sweet, without being aggressive. Confirms the nose, with notes of green apple, malted barley and cereals. Finish: short, with a malt bitterness and a marked return of fresh nuts and butter.